Sometimes you need to go back to basics. 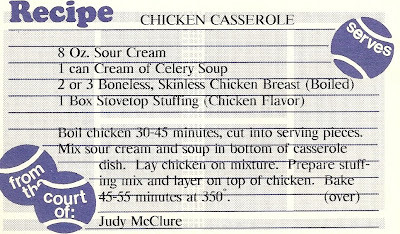 I found this in my recipe box the other day. I'm not sure if I'd ever made it before. Judy is the Mom of one of my good friends. I have a vague memory of asking her for recipes when I first got married and this is a good 'old tried and true casserole dish she gave me. This is my kind of cookin'. FOUR ingredients. Mix together and bake. Folks, it doesn't get any easier than that. And it was delicious. Try it for yourself. Moms know how to please. They just know.